Building the elegant bedroom suite you've dreamed of has never been easier with our Amish Versailles Collection! Handcrafted from the finest hardwoods that North America has to offer, bench-built and finished to perfection, our Amish Bedroom Furniture is sure to be your best investment in heirloom quality furniture! 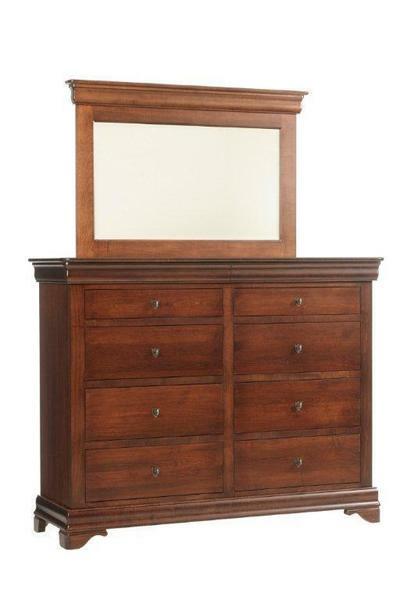 The Versailles High Dresser featuring an elegant design and luxurious details that will make a huge impact on your bedroom decor! Featuring eight, fully extending drawers and two hidden felt lined jewelry drawers, you're sure to have ample room to store everything you may need when getting ready to face the day! Add the beautifully beveled, matching mirror that will allow you to see how amazing you look, before heading out every morning! Call one of our experienced furniture specialists today to help you with any questions you may have on our Versailles bedroom furniture! We offer stain samples, so you can be sure you are getting just the right hardwood and finish combination to accentuate your unique space!